There’s something reassuringly luxurious about wooden toys. More substantial than plastic, warmer to the touch and made from natural materials: they last longer and can handle the rough and tumble of child’s play. One tends to think of wooden toys in a nostalgic way because they remind us of the era when things were made with more care and designed to last. However, there are some very contemporary wooden toys on the market – if you know where to find them. One of my favourite suppliers is The White Company in London who have some fantastic toys for younger children such as the Noah’s Ark and London Bus, pictured. 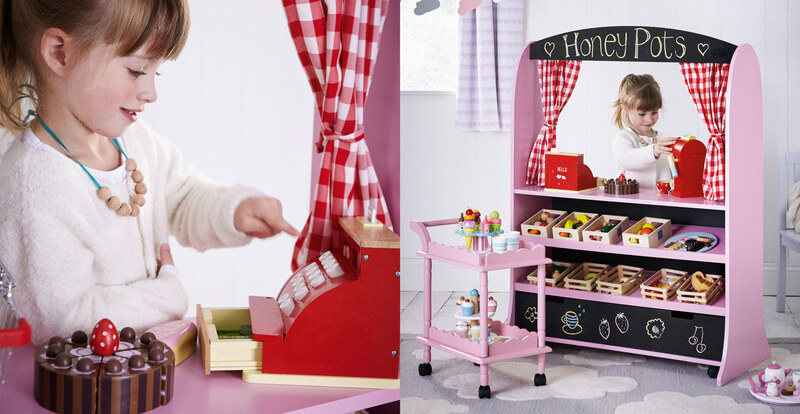 My daughters adore this wooden kitchen set from the Great Little Trading Company – and I can see why they find it so appealing. Besides being beautifully coloured, it also comes with a range of built-in appliances including a tap and sink, a fridge, an oven with opening door, a washing machine, microwave and storage cupboard. It even has a hob with clicking knobs. 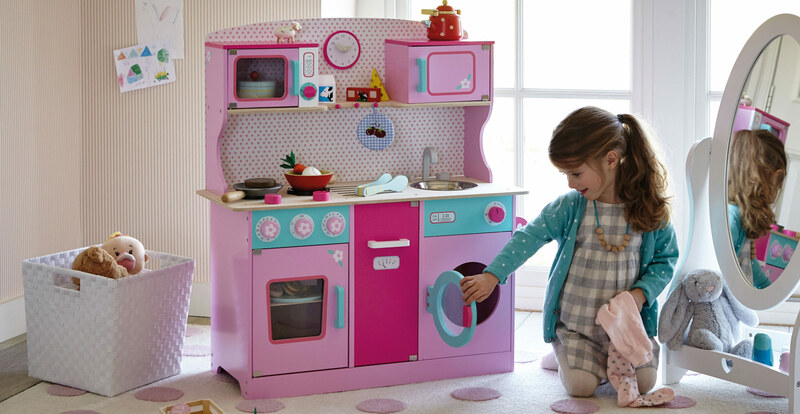 It has everything your kids will need to have hours of fun cooking up their own version of Bake Off and Masterchef. Three, two, one … bake! If roleplay is your child’s greatest pleasure, they may also be interested in this fabulous playshop and theatre combo. Exquisitely designed to work as a shop on one side and a puppet theatre on the other, you kids can have hours of fun entertaining themselves and the family and play shops or cafe’s whenever they like. GLTC even produces a range of equipment to go with it, so you can fully stock your shop and provide the essential till! For the more active kids, Great Little Trading Co also has some fantastic wooden ride-on toys. I think these funky wooden scooters are very cool. Their Italian, retro designs are super chic and as for functionality, the imulti-directional castors give fun, free flowing movement in all directions. You can certainly see why this fab scooter won a Junior Magazine Design Award for Best Toy Design (0-2 years). And being made of wood it’s pretty much going withstand lots of knocks and last long enough for you to get your money back on eBay after your kid’s grown too big for it. GLTC also have traditional wooden gifts such as this great wooden farm, with its own barn, hayloft, cow shed and stables. You can also purchase a wide range of animal accessories and even a tractor. 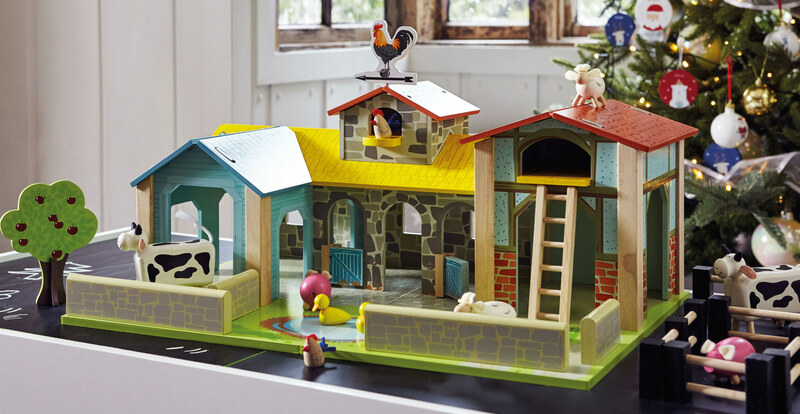 You kids can have hours of fun playing farmer and looking after the animals in the knowledge that these sturdy wooden pieces aren’t going to fall to pieces or break like plastic toys do. There’s lots more to see at GLTC too. Why not check out their pirate ships, easels, work benches, train sets, activity walkers…. The list goes on. Eight times winner of Best Children’s Retailer and winner of the Best Independent and Best Online Retailer Awards, GLTC is a British company that provides both great products and great service to its customers – including international delivery and free returns. Why not visit GLTC now.